World 1-2 is the second level of Grass Land in Super Mario Bros. 3 and the second overall in the game. Clearing this level gives access to World 1-3, World 1-4, and World 1- . The player starts off at the bottom of a hill, which has a sideways Goomba-spawning pipe at the top. On the other side of the hill is a ? Block which holds a Super Leaf. Using the ? Block as a platform, the player can jump over the "T"-forming tall pipes, the top one of which also spawns Goombas. At the bottom of the next hill are a collection of Coins, and a P Switch in a Brick Block below the floating Warp Pipe, which the player can activate to change the Coins into bricks to reach the floating pipe and enter a secret room. After jumping up a tall hill, the player will find Note Blocks, one of which holds a Super Leaf. Afterward are some pipes with Fire Piranha Plants in them, and some Note Blocks that can help the player get across the pit, the last of which holds a Super Star. After the next sideways Goomba-spawning pipe is a Paragoomba and the Goal. 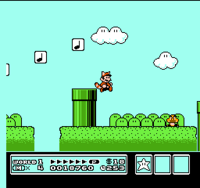 By utilizing the Goomba-spawning pipes in the level, alongside Raccoon Mario's gliding to jump from Goomba to Goomba, the player can rack up an extraordinary number of lives. This page was last edited on April 7, 2019, at 17:46.